Basketball shooting games are a terrific way to teach young players how to shoot the ball under pressure. It's one thing to demonstrate textbook shooting technique when it's just you and the hoop. It's another thing altogether to add an element of competition in a dynamic situation. No doubt, one of the best avenues to better basketball shooting is to play basketball games that force players to shoot under pressure. It really doesn't matter how consistent a shooter is during warm-up. It's how they perform in the heat of battle that really counts. The challenging basketball shooting drills below provide an opponent - either real or imaginary - that players try to defeat. 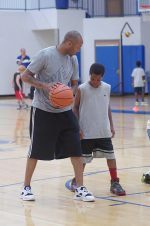 These games are perfect for 1-2 people, but if you have a team of players, check out more youth basketball coaching drills that include fun competitive drills for all fundamental skill areas. Player shoots from 5 spots around the key: right baseline, right wing, top of key, left wing, left baseline. Shoot a 3-point shot from each of the 5 spots. Each 3-pointer made is worth 3 points (for a total of 15 points.) If player are unable to shoot 3-pointers, move the shooting spots closer to the basket. From each spot, take one dribble in for a jump shot. Each jumper made is worth 2 points (for a total of 10 points). Start at each spot and dribble in for a lay-up. Each lay-up made is worth 1 point (for a total of 5 points). The maximum number of points possible for 100% shooting is 30 points. End the game with a 1&1 free throw. Shoot the first free throw. If the basket is made, take the second (for a total of 2 points). The best score a player can get if they sink every basketball shot and free throw is 32 points. Pick a spot on the court and see how many basketball shots you can make in a row without missing. Always keep track of your best record and try to beat it next time. Move to a new spot and repeat. Add the pressure of time. See how many consecutive shots you can make in a certain period of time. Challenge a friend. See who can make the most shots in a row. Work together with a friend. Each player shoots 2 shots at a time to see how many shots they can make in a row together. When someone misses, start over and try again. Shoot 2 shots from 9 ft away (the bottom of the circle), then 2 shots from 12 ft, then 2 shots from the free throw line (15 ft). The goal is to make all 6 in a row. Change the number of shots you take at each spot. Instead of 2-2-2, try 6-4-2 or 8-4-2. Change shooting spots. Start on the baseline and work out toward the sideline on both sides. Or start on the wing and work out toward the sideline on both sides. Adjust the distances of each shot. Start closer to the basket if you need to and move back in increments of 2 ft until you get a little better. Shooting percentage is an important statistic to track to see how accurately your players shoot. This basketball shooting drill helps players figure their shooting percentage based on different numbers of shots. Start out by taking 5 shots and see how many you can make. 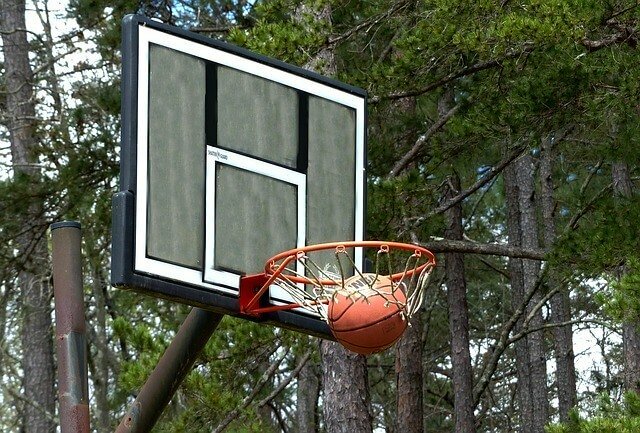 Figure out your shooting percentage by dividing the number of made shots divided by the total number of shots taken. Then try 10, 20, 50, or 100 shots and keep track of the number you make and your shooting percentage. Add the pressure of time. See what percentage of shots you can make in a certain amount of time. Start with 1:00 and keep track of how many shots you take and how many you make. You may need a friend to help you keep track. Shoot from different spots on the floor. This will give you a good idea of your shooting range and where your best shooting spots are. Pick any of the basketball shooting games and add vocal and/or visual distractions to develop players' concentration skills. Play loud music or have a friend make noise and yell while you're shooting. Put obstacles around the court that you have to avoid while playing the game. Have a friend wave her arms or other objects around to distract you. Have a friend charge at you like he's going to try to block your shot. Have a friend push on you a little bit to work on shooting while getting fouled. This game takes two players. Player 1 stays outside and shoots perimeter shots while the Player 2 stays near the basket to get the rebounds and tip-ins (or put backs). Player 1 picks a spot anywhere on the court and shoots 7 shots. Each made shot is worth 1 point. If Player 1 misses the shot, the rebounder (Player 2) attempts to tip-in the miss. For younger players, the rebounder can rebound the ball, come down with it, and have one chance to put the ball in. If Player 2 makes the shot, it's worth 2 points. After 7 shots, the players switch positions. The first player to 21 is the winner. When you're ready for a break and want to chill out with some friends try your skills with an arcade shooting hoops game!